You know when something happens in the world, and you remember exactly what you were doing and where? Well, get ready for another one of those moments - LG has launched the first OLED TV with incredible 8K resolution at IFA 2018. Let's get into the specs: this is a massive 88-inch TV with 7680 x 4320 resolution, which feels like too many pixels to really be looking at. That said, we're pretty sure we said the same thing about 4K sets, and Full HD too... and now we're seeing those resolutions in smartphones. 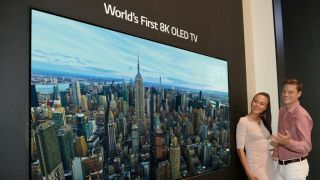 There's no more information on this massive television, other than LG expects 8K to be the next big thing (which is hardly a surprise given it's just shown off a massive device based on the technology. 'See, Jenny... the clarity of the brightness against the rich darks?' 'I don't love you any more, Barnaby. I'm going to stay with my sister'. The worrying thing is there's no word on a release date and price for this huge TV, which means it'll probably be on the higher end of cost. Given LG's first 77-inch 4K OLED TV cost £20,000 (around $25,000 / AU$35,000) when launched four years ago, we can't see this set being much different. There's also no word on whether it will add upscaling technology into the mix, allowing you to view HD or 4K stuff at a sharper resolution - essentially, this is mostly just LG showing off its TV-making prowess at the massive Berlin show this week. Still, we can always dream - and in 2022, when 8K TV is supposed to be the dominant tech for your TV, we'll remember this moment, right here. When the first one launched.